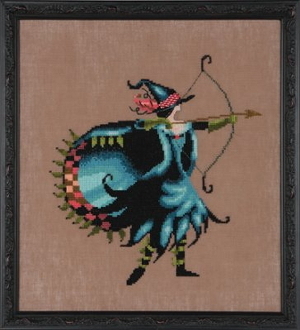 A beautiful counted cross stitch design by Nora Corbett's Bewitching Pixies Collection. Materials required (not included): 32 count Milk Chocolate Linen by Wichelt Imports (see item 31-142), alternate fabric 14 count Milk Chocolate Aida by Wichelt Imports (see item 31-114). Mill Hill Embellishment pack NC208E (see item 29-162) and Kreinik 850 Mallard (see item 32-114). DMC embroidery floss: 310(3), 413, 469, 470, 471, 754, 775, 829, 891, 936, 948, 964, 3328, 3341, 3721, 3808, 3810, 3849.